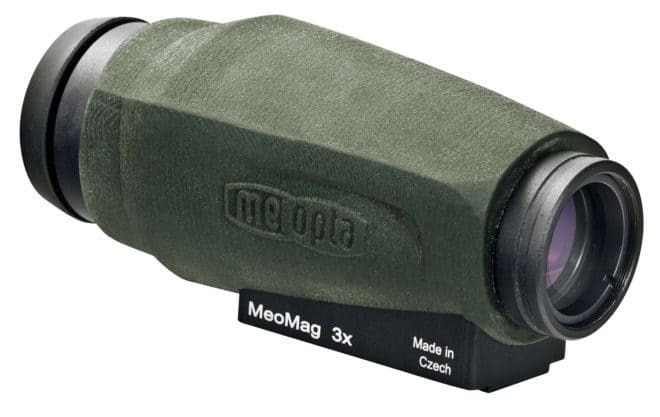 Meopta has announced a new 3x magnifier for red dot sights called the MeoMag. While it is designed to be used in combination with a red dot optic, you can also use it as a monocular. While the MeoMag certainly is a perfect match for Meopta’s line of red dot sights, it also works with pretty much any other red dot on the market. It is an ideal companion for Meopta’s MeoRed T, the T-mini, MeoSight III and others. The magnifier is designed to double as a monocular. It fits comfortably into your palm due to its ergonomic shape. When used with a red dot sight it can easily attached and removed with the quick release mount. Alternatively, the MeoMag can be mounted with an optional hinge mount. You can then flip the magnifier to the right or left to get it out of the line of sight! The Meopta MeoBright features multiple coatings. These eliminate or reduce glare and reflections. Meopta calls their coating combination MeoDrop and they are designed to ensure the highest level of visual clarity no matter the environmental conditions. The coatings repeal rain and snow as well as oils from skin and dirt to provide a clear image under all conditions. In addition to the outstanding optical capabilities, the MeoMag 3x is also designed and built to be water- and fogproof as well as shockproof. This way you can use it even in the most demanding situations! The magnifier is also fitted with Fast Opening Lens Covers (FOLC). The suggested retail price is set to $999.99 by Meopta. The street price is expected to be lower than that. The Meopta MeoMag is a great magnifier. It doubles as a monocular which makes it an even better buy. The pricing is certainly on the high-side and you can get less expensive magnifiers for your red dot sight that are also of highest quality! If you use a Meopta Red Dot sight though then you might not find a better match than the MeoMag 3x though!